Maxine Hertha Winston, 93, a 70-year resident of the Berthoud area, passed away Friday, April 10, 2015. Private graveside services were held at Mountain View Cemetery in Longmont. Maxine was born on December 28, 1921, at Lexington, Illinois to Jasper and Emma (Stinde) Terven. She grew up in the Lexington area where her father farmed. 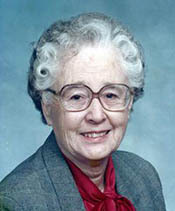 After high school, she attended Illinois State Normal University where she completed a degree in education in 1942. She taught in elementary schools in the area before meeting Carl Hertha, a sergeant with the Army Air Corp who was stationed nearby. They were married on December 28, 1943, and returned to the Hertha family farm west of Berthoud following Carl’s completion of military service. They soon welcomed daughter Sharon and son Gene to the family. Carl and Maxine lived on the farm until Carl’s death in 1991 when she moved in to Berthoud. In 1993 she married Charles “Chuck” Winston. They enjoyed many years traveling in their camper and “snowbirding” in Texas and Arizona. Following Chuck’s death in 2011, Maxine moved to assisted living in Loveland, and then to nursing home care near her daughter in Sterling. She taught Sunday School for many years at the First Presbyterian Church in Berthoud, established a lending library of Christian books within the church, and was active in several women’s groups there. Maxine belonged to Mountain View club, originally a group of farm wives, for over 60 years. She especially enjoyed her time with the members of Chapter AS of PEO. Maxine cherished her time with her daughter, Sharon and her family. She considered step-children Francis and Susan Winston and their families as much “hers” as they were Chuck’s and delighted in all their children and grandchildren’s accomplishments. She is survived by daughter Sharon (Rod) Tseu, step-son Francis Winston (Sharon), step-daughter Susan Winston Vickers (Winston) and their families, grandson Jonathan (Erin) Tseu, great-grandsons Grant and Carter Tseu, and brothers Dale and Gerald Terven. She was preceded in death by her husbands, Carl Hertha and Charles Winston, son Gene, and sister Phyllis Sweet. Kibbey-Fishburn Funeral Home was in charge of arrangements. Memorial gifts may be given in Maxine’s name to the First Presbyterian Church in Berthoud. Site contents copyright © 2019 Recorder Online	except as noted. All rights reserved. | 89 queries in 1.115 seconds.